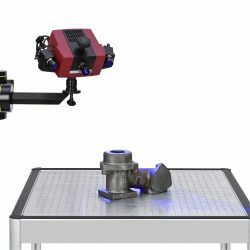 The Compact Scan incorporates blue light technology with parametric inspection software into a compact design ideal for increased versatility. Manufactured with high quality components, the lightweight sensor enables adaptability to a vast range of applications and environments, particularly for narrow areas. 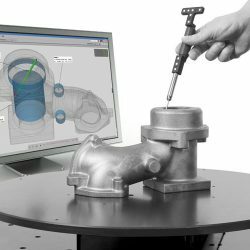 Castings, injection moulded parts, interiors, prototypes, vehicles and aerospace parts can all be measured quickly and effectively using the Compact Scan Technology. GOM’s new narrow banded projection technology enables precise measurements to be carried out independent of lighting conditions, minimum heat development and low maintenance. 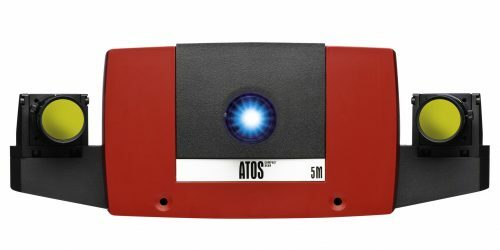 Unlike laser scanners, ATOS technology allows adaptable hardware to measure various sizes by changing measurement volumes. 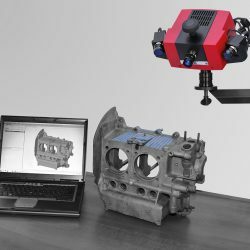 The Compact Scan has an interchangeable measurement volumes from 35 to 1200 mm², which can also be combined with TRITOP digital photogrammetry for very large projects. The portable solution fits into an easy to transport case that can be checked-in as luggage for remote work. The case includes the ATOS Sensor, stand, calibration artifacts and optional accessories. The ATOS Compact Scan is configurable with a high end laptop, providing the ultimate flexible solution for all working environments.